A Widnes gardening project is celebrating after scooping another gong – this time with a big bag of cash to fund further development. 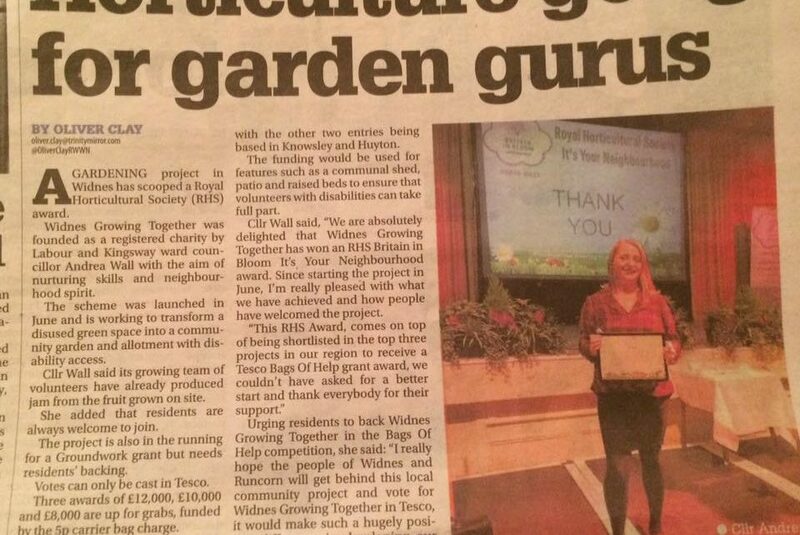 Widnes Growing Together triumphed in Groundwork’s Bags Of Help contest funded by the Tesco 5p carrier bag charges hot on the heels of winning a Royal Horticultural Society award. The project is a registered charity and gives residents the chance to grown their own produce in an allotment or work with flower beds, a community garden and a variety of apple trees. It was launched in June by Kingsway ward councillor Andrea Wall and now has £12,000 to splash out on a communal hut, patio, raised beds for disabled participants and access. Volunteers have already produced their own jam. the two other contenders were based in Knowsley which had about four branches of the supermarket compared to Halton’s one. She said Widnes shoppers must have thrown their support behind the project and could now look forward to the project’s development. The Kingsway councillor said: “We’ll be getting a hut and hopefully a toilet and then we will be all systems go. “A new gate is on order, the old gate is not functioning properly and people find it hard to open. “I certainly didn’t expect we would win. “We’ve got one store in Halton and I think they had about four over in Knowsley. “The people in Halton must have got behind the Widnes project. She added that residents have welcomed the extra greenery into the area since the project’s launch. Cllr Wall said: “The land hadn’t been used for years. “It was a lot of work.